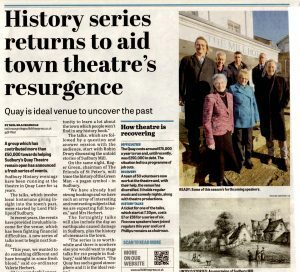 The Suffolk Free Press recently published a piece on the return of the Sudbury History evenings to be held at the Quay Theatre. Sudbury Ephemera Chairman Sue Tibbetts had the pleasure of giving one of these diverse talks. Sue’s talk explained the purpose of the Archive and give some insights into the gems that SEA are now preserving for the future that would have ended up in landfil. This entry was posted in Press Coverage. Bookmark the permalink.